The plan is for beer and appetizers at a bar/pub and dinner at La Tavola, which some feel is the best restaurant in this area after Murphy’s. 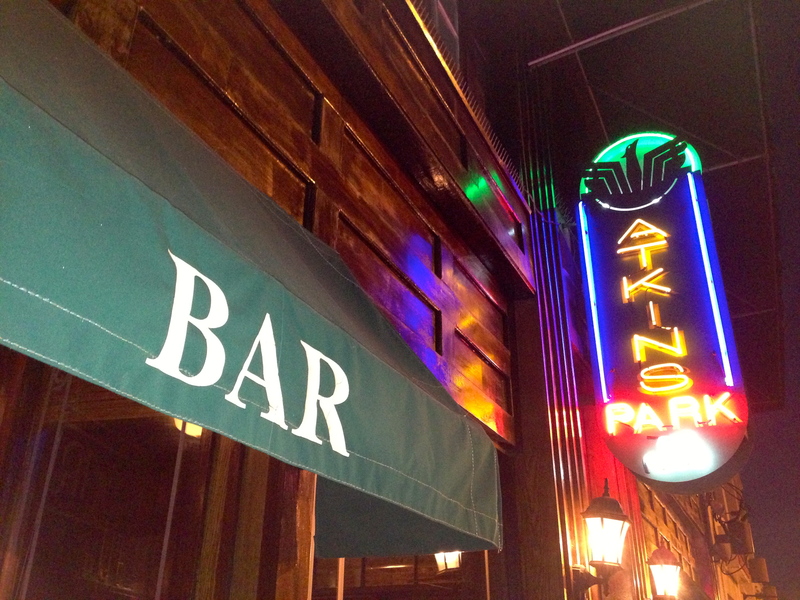 We want to go to Atkins Park, which is the oldest (since 1927) continually operating restaurant in Atlanta. Historic bar, but we don’t smoke. We walk in and are confronted with clouds of cigarette smoke from the bar. Date Night is radically non-smoking, so we leave, looking for a similar establishment with no smoking. The next three tavern-like places we pass all have ashtrays on the tables, so we continue our walk towards La Tavola. Right across the street from our final destination is Taco Mac, which we know is going to have a good beer selection. We pop in and order some Christmas beer, as that’s what the brewers are making now. It’s Christmas beer time! Sweetwater Festive Ale and Sierra Nevada Celebration. 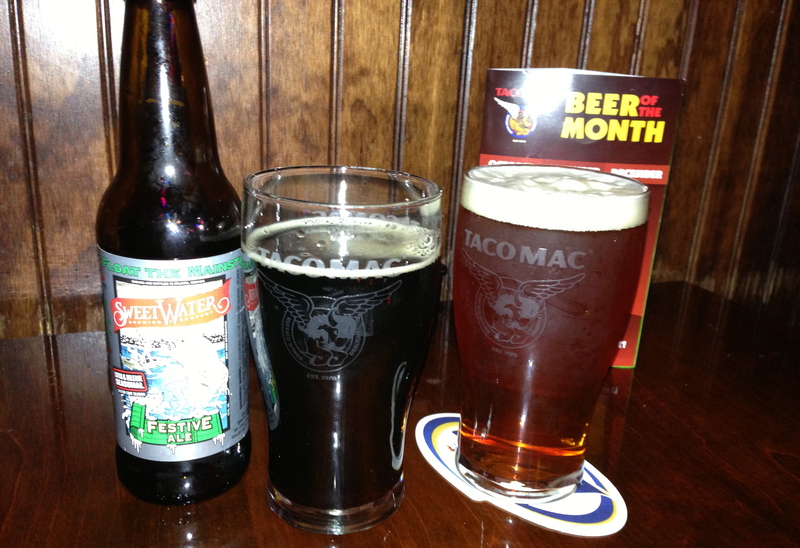 Sweetwater has made a great malty festive beer this year. I thought the Sierra Nevada was a little hoppy for a Christmas beer, but if you like your hops, you will like this beer as well. We are hungry, and when at Taco Mac, you have to get the wings. When at Taco Mac, the wings are the specialty. These are mild with ranch dressing. 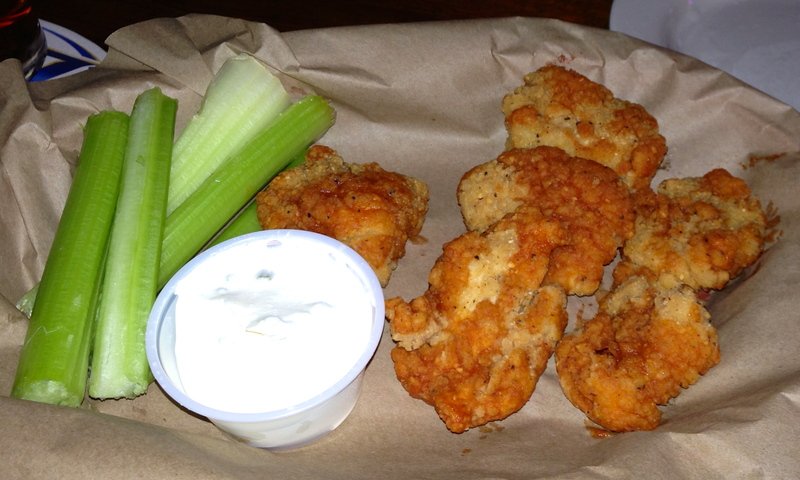 The boneless wings are crunchy and filling. They don’t really go with our upcoming dinner, but they go well with the Christmas beer. It’s early, so it’s family night at Taco Mac. Fortunately, the children are not as annoying as the cigarette smoke at Atkins Park. It’s time for our reservation, so we cross the street and go into La Tavola. We are offered a table in the crowded interior or a table on the heated and enclosed deck outside. Since the heat is on outside, we choose the deck. It must be wonderful to eat here during warm weather, and the heat on this cold night feels good. We are greeted with a basket of bread. 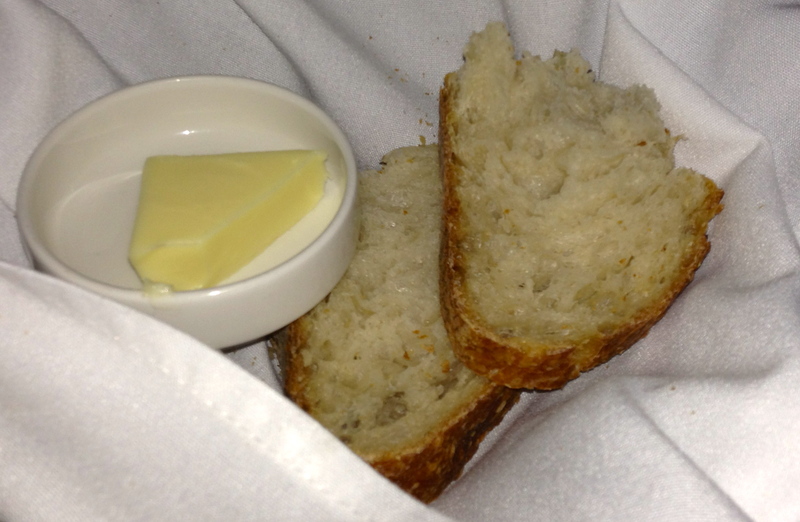 Half an order of bread. The other half is about to go in our tummies. It’s warm sourdough and the butter melts as soon as it’s spread on it. We have had our beer and appetizer across the street, so we jump right into the main part of the menu. For our first course, we split the short rib risotto. 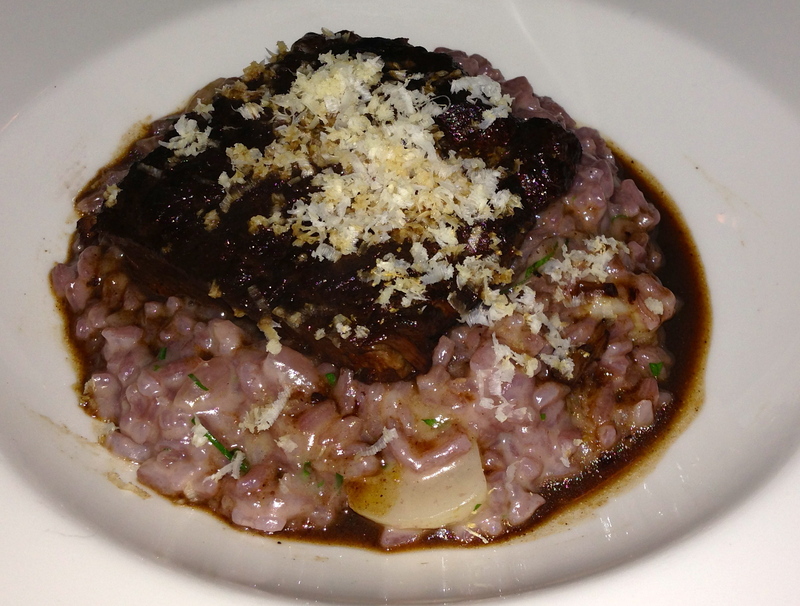 Risotto with short rib on top. The pink tinge is from red wine. They make the risotto with red wine, which gives it a wonderful flavor. The short rib is superbly tender and falls apart as soon as we touch it with our forks. Course one is a big success. Next, we order the zuppa di pesce. Zuppa di pesce means “fish soup”. It comes with clams, calamari, shrimp, and some mahi-mahi in a spicy broth. 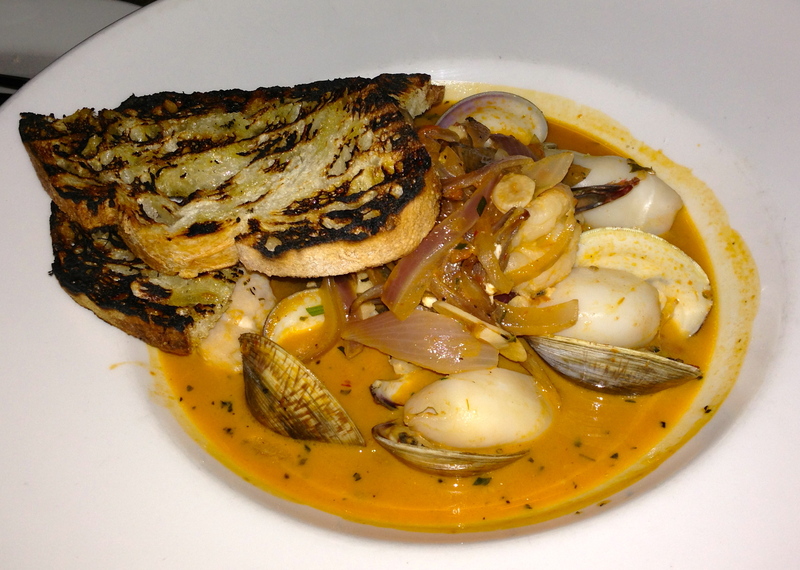 The grilled bread is great for sopping up the broth. This is not a huge portion, so don’t order this to share. The zuppa is not very filling, but that leaves room for dessert. We order the local apple-cranberry tart. 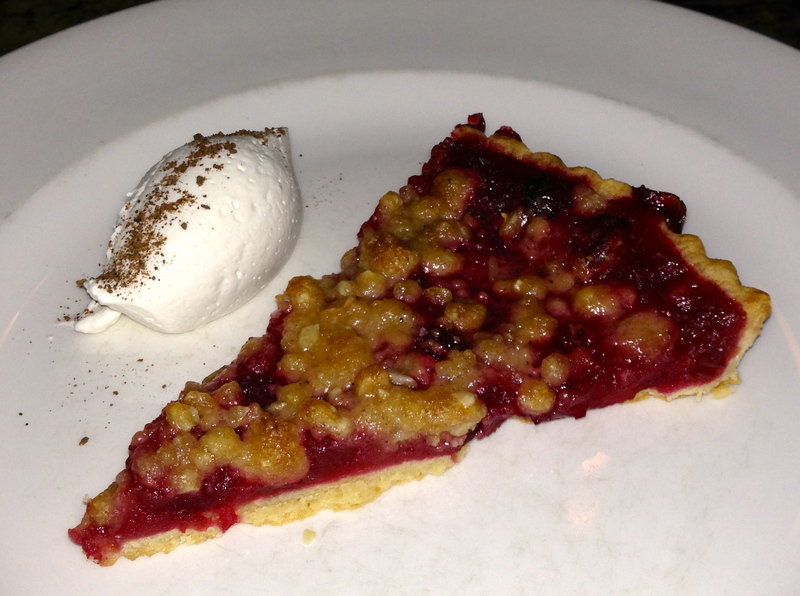 Apple-cranberry tart finishes the night. This is a great way to finish off our diverse “American-Italian” dinner. It’s not too sweet and the olive oil-infused marscapone cheese that comes with it is more interesting than regular whipped cream. So do we find the best Italian food in Atlanta? 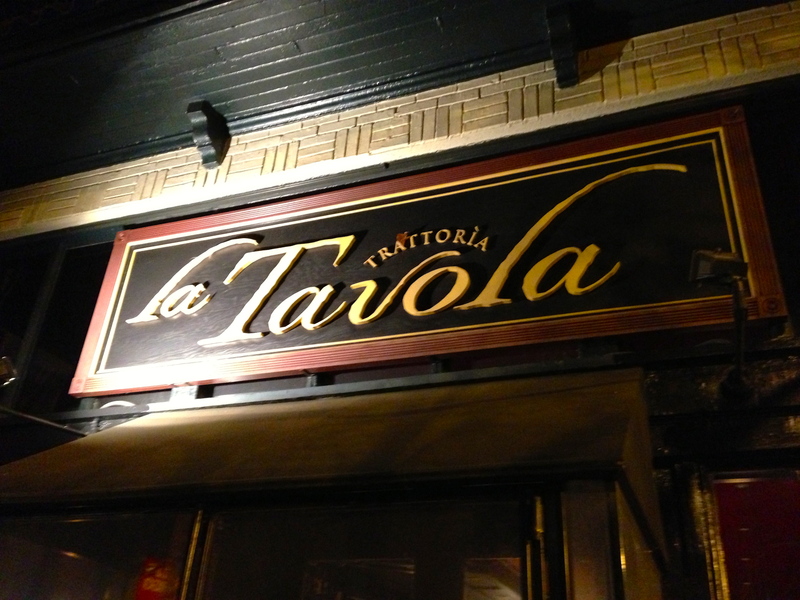 The service at La Tavola is great and the place is packed when we get there and still crowded and noisy when we leave. The food is excellent, although we would have to sample more of the menu to call it “the best”. It’s definitely worthy of a visit for those looking for something different in the Virginia-Highlands area. Date Night Extra: The Morning After! Wait! We’re not done yet! The next day, we find ourselves right back in the Virginia-Highlands area for a fun running race, but before we run, we go to the American Roadhouse with our dear friends Claudia and Randy for some brunch. We walk around a bit before we pick the Roadhouse, but it smells so good (think fresh waffles) that we must go inside and investigate. We all order different things as we fuel up for the race ahead. Some pick sensible, but I go decadent. We’ll get to that in a moment, but let’s look at a sensible dish. Goat cheese scramble at American Roadhouse. 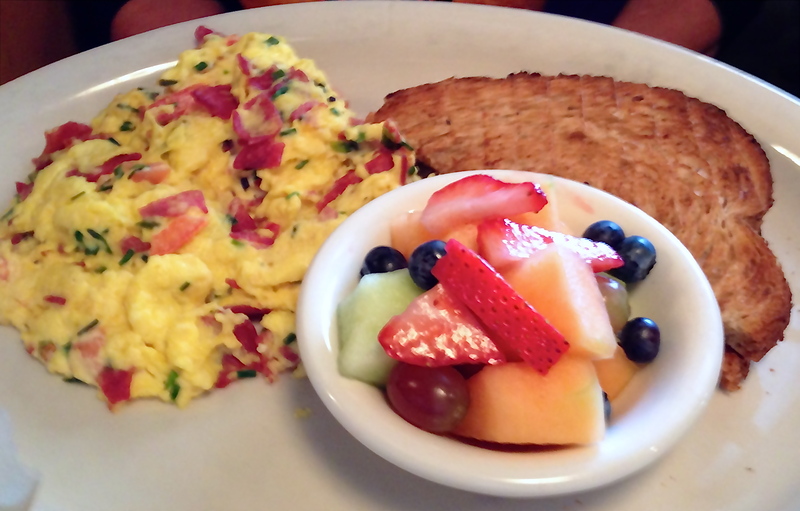 Claudia chooses the goat cheese scramble. This is a good, sensible dish to eat before running 2.5 miles. Randy goes for the cheeseburger. 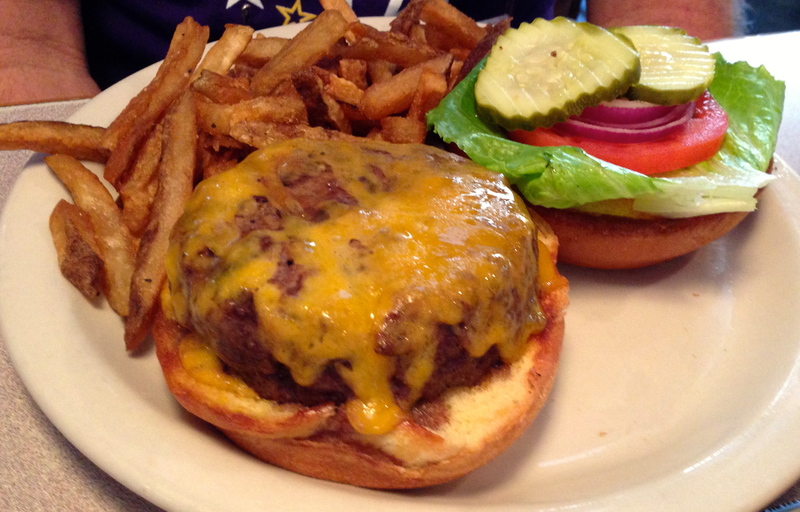 American Roadhouse cheeseburger. The fries get sent back. The fries look a bit limp and soggy, and they are sent back. The replacement fries, not seen here, were much crispier and hotter. Eve, also sensible, orders a simple meal. The Roadhouse Breakfast. Good, hearty food. 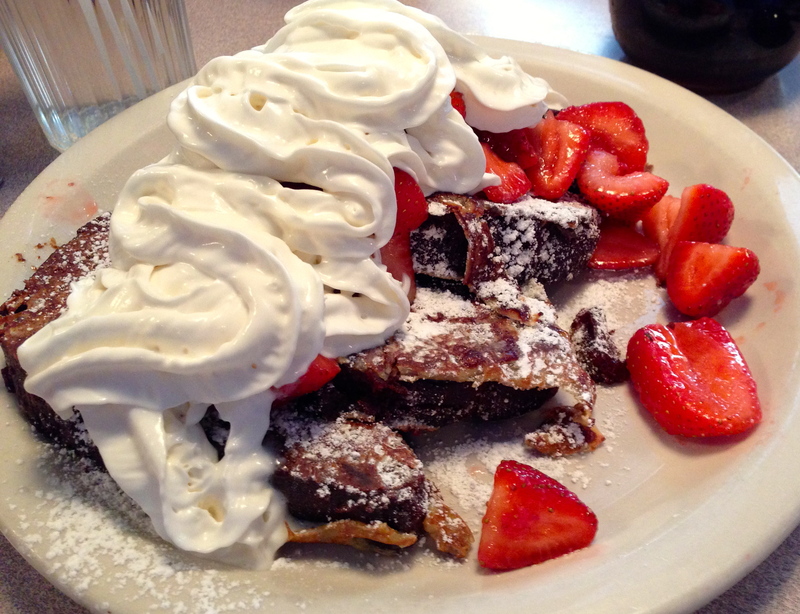 Chocolate pound cake French toast. Decadence on a plate. OK, probably not the best choice to eat before a run, but it is a treat. It is a huge portion, and fortunately I get some help from my friends in eating it. When I am running an hour later, I am pleased to report that it stays in my stomach for the entire run. The American Roadhouse was good. The portions are large and you will not leave there hungry. The waffles and “regular” French toast that I see also look quite tasty. 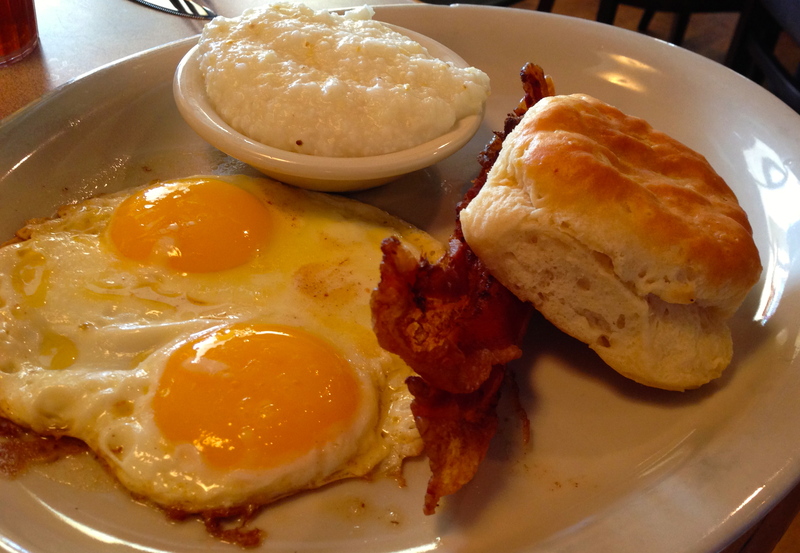 They only do breakfast and lunch, and it’s another place to check out in the Virginia-Highlands. Coming up in our next entry–it’s Date Night #50, a big blogging milestone!